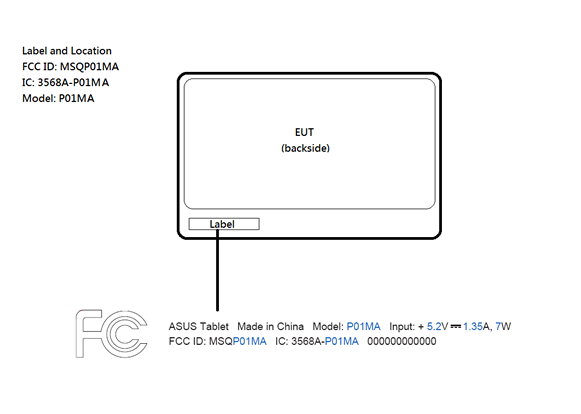 We spoke recently about a mysterious ZenPad with the product or model number P01MA that showed up on the Bluetooth Product directory. This was an oddity as the P01M was shown to be the Z580C, the $199 ZenPad S 8.0 that is currently exclusive to Best Buy. So when we spotted the P01MA, it was realized that in fact it was the Z580CA model. The question a couple days ago was whether there was going to be a separate FCC submission or was is close enough to the Z580C. We now have the answer. Indeed, the P01MA has shown up at the FCC. There is good news and bad news on this. Good news is that it’s certainly coming within the next 2 to 4 weeks (a regular contributor to the site Dan says, “The Equipment Under Test(EUT)was listed as a production unit, not an engineering sample. This would lead me to believe we will see it on the shelves soon.” The flip side is that we may know the date, but it means a bit more waiting. Can it show up earlier than a few weeks on store shelves? Perhaps, not entirely likely though based on history. However, be happy in the sense that the accessories should be in the stores also by that time. So if you want that TriCover case and the Z Stylus pen, those should be in stock by the time the Z580CA hit the store shelves. Heck, at least there is something tangible now. It’s here and it’s coming! Sound the trumpets! The king is arriving (eventually)! We will look for any indicators and supplier details as to a possible arrival date. Well, atleast we know something now. What are we thinking 2 or 3 weeks before a concrete release date?